Caption: PAD system. Left, four optical testing cubes (blue and white) stacked on the electronic base station (white with initials); right, a smartphone with a special app to receive test results transmitted by the electronic base station. Every year, hundreds of thousands of Americans acquire potentially life-threatening bacterial infections while in the hospital, nursing home, or other health-care settings . Such infections can be caused by a variety of bacteria, which may respond quite differently to different antibiotics. To match a patient with the most appropriate antibiotic therapy, it’s crucial to determine as quickly as possible what type of bacteria is causing his or her infection. In an effort to improve that process, an NIH-funded team is working to develop a point-of-care system and smartphone app aimed at diagnosing bacterial infections in a faster, more cost-effective manner. The portable new system, described recently in the journal Science Advances, uses a novel light-based method for detecting telltale genetic sequences from bacteria in bodily fluids, such as blood, urine, or drainage from a skin abscess. Testing takes place within small, optical cubes that, when placed on an electronic base station, deliver test results within a couple of hours via a simple readout sent directly to a smartphone . When the system was tested on clinical samples from a small number of hospitalized patients, researchers found that not only did it diagnose bacterial infections about as accurately and more swiftly than current methods, but it was also cheaper. This new system can potentially also be used to test for the presence of antibiotic-resistant bacteria and contamination of medical devices. At first glance, this image looks like something pulled from the files of NASA, not NIH. But, no, you are not looking at alien orbs on the rocky surface of some distant planet! This is a colorized scanning electron micrograph of a white blood cell eating an antibiotic resistant strain of Staphylococcus aureus bacteria, commonly known as MRSA. 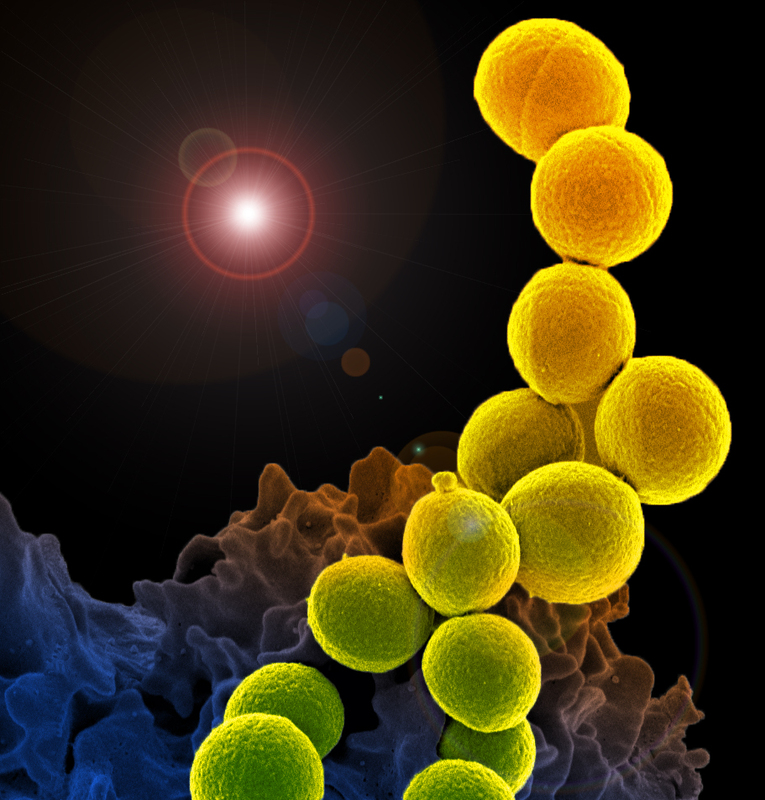 MRSA stands for methicillin-resistant Staphylococcus aureus, and it’s one nasty bug. You’ve probably heard about the dangers of MRSA infections, but what’s the easiest way to prevent one? Just like with the flu, you should wash your hands – frequently! Personal hygiene is key. And while MRSA infections are more common in people with weakened immune systems, other folks, such as athletes who share towels, are also vulnerable. To learn more about MRSA and how to protect yourself and your loved ones from this increasingly common health risk, go to http://www.nlm.nih.gov/medlineplus/ency/article/007261.htm.